Viewed looking north from the present Fosse Way, showing its alignment. Viewed looking north from disused canal, showing ridge and furrows in foreground. 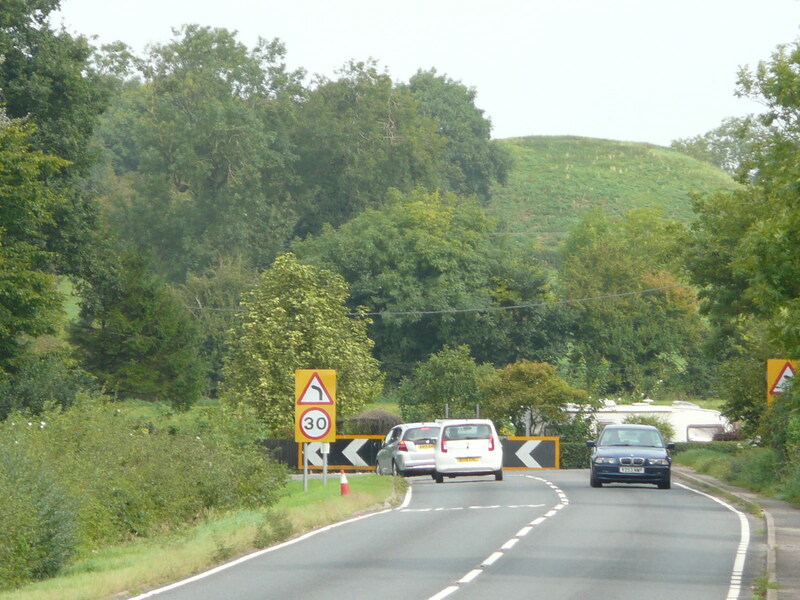 View of the embanked bailey, showing ditch around the motte. 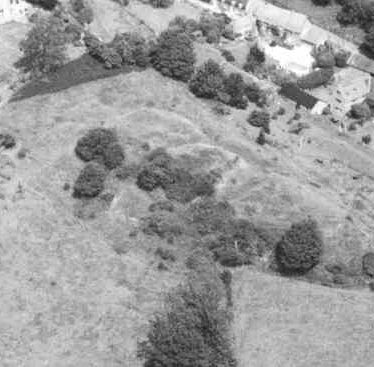 1 `Very imposing and remarkable earthworks of the moated mount and court type… as fine an example… as can be seen anywhere within the kingdom.’ The works occupy a strong position on a short elevated ridge. The mount, with five elm trees on its summit, is a conspicuous landmark with magnificent views. It is placed right on the line of the Fosse Way. To the W lies an inner court, defended by a rampart and ditch and beyond this is a second and larger court similarly entrenched. The entire work covers 1.8 to 2.1 ha. 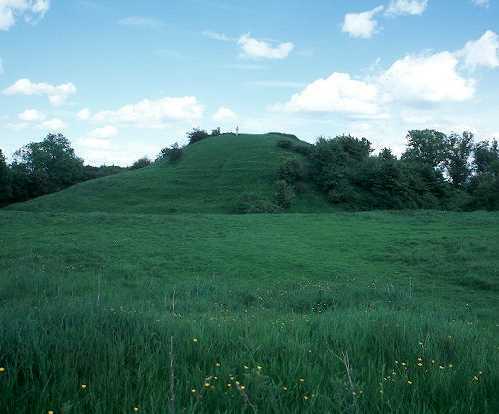 The mound rises 12 M from the surrounding land and is 79.2 M in diameter at base. Its top is flat and measures 15 M across. The surrounding ditch is 6 M deep and 12 M wide. The two courtyards are on slightly lower ground. 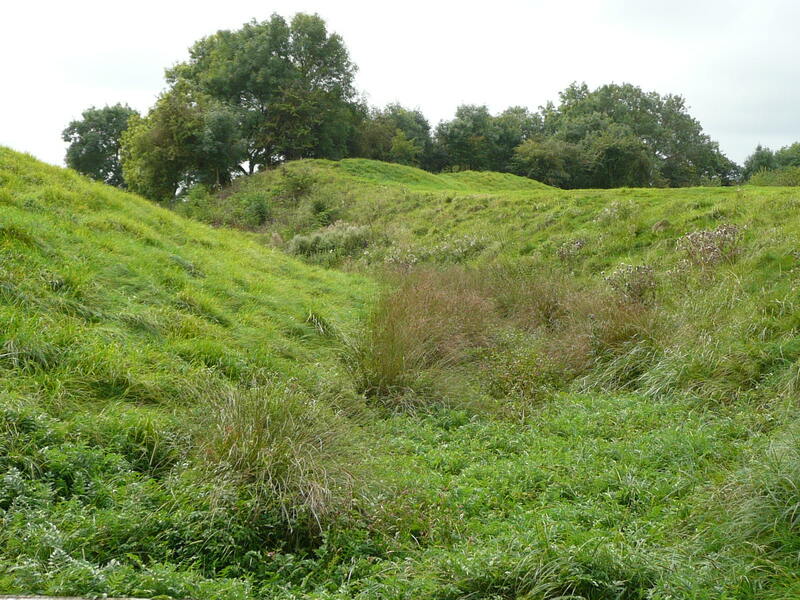 Inside the ditches are remains of a rampart. There are now three entrances into the courts, but it is unlikely that any of these are original. The whole of the palisading was doubtlessly of wood. 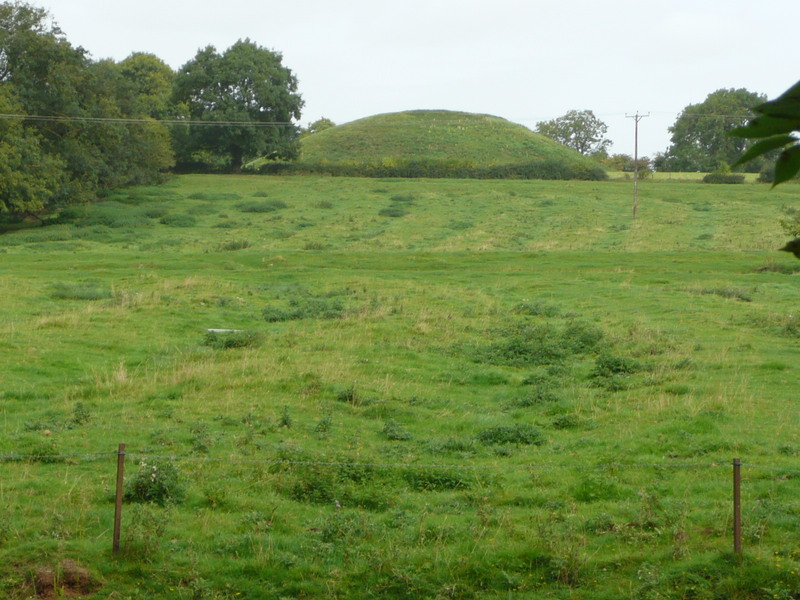 2 Chatwin suggests that the Normans used a pre-existing mound (PRN 6009). Brinklow was given to Earl Alberic, then – after being in the King’s hands – to the Earl of Mellent, then later still to Nigel de Albany. Its interest as a castle ceased at an early period. It was probably a Norman castle of major strategic significance. 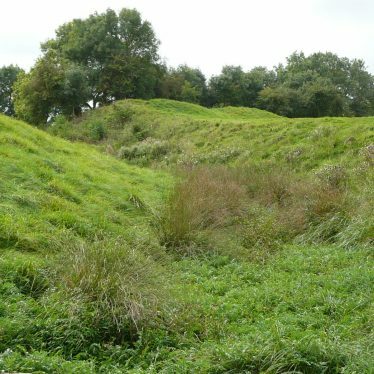 5 The castle`s position on the Fosse Way and the fact that it is located almost halfway between the castles of Warwick and Leicester suggests that it was one of a number of castles built at strategic points on the Fosse Way. The Church of John the Baptist, Brinklow. The church was originally built during the Medieval period and may have originated as a castle chapel. 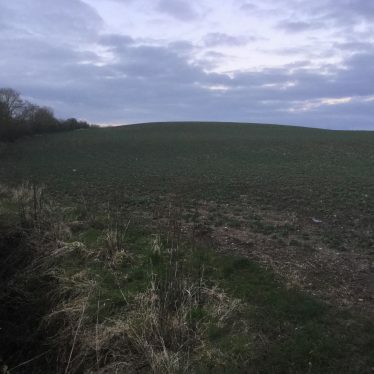 It is situated north east of the Recreation Ground, Brinklow. The Old Rectory, a vicarage which was built during the Imperial period. It is situated in Brinklow. Historic inn situated on the east side of Broad street. Brandon Castle, the site of a Medieval castle, with associated castle keep and moat complex. 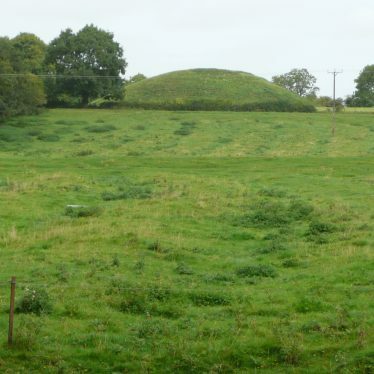 Documentary evidence exists for some of its history, and some of the earthworks have been patially excavated. The castle is situated 300m south of Brandon. 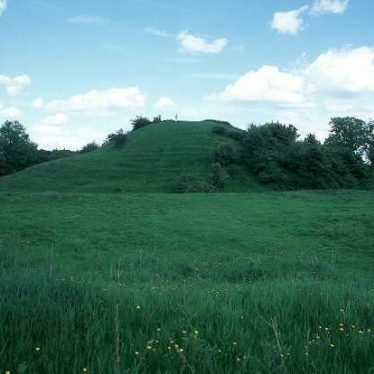 The possible site of a castle is suggested by documentary evidence. The site is located at The Grove, 700m north east of Ashow. The possible site of a Medieval castle. The site is located 100m west of the church at Newbold on Avon. The remains of the Medieval keep of Brandon Castle were found during an archaeological excavation. 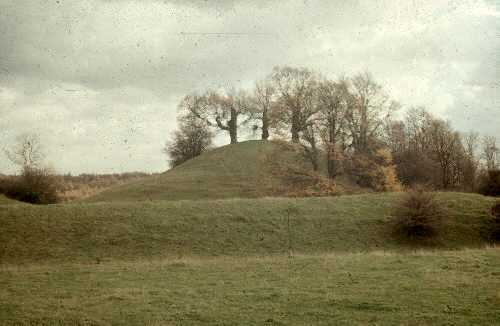 The remains of a motte and bailey castle, which was the predecessor of the later Medieval Hartshill Castle. 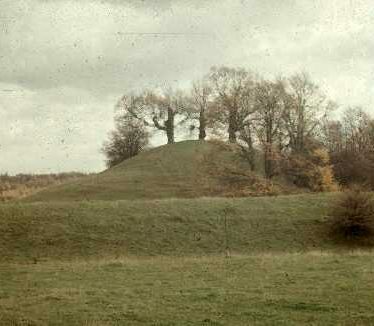 The motte is still visible as an earthwork and is situated to the east of Hartshill Hayes Country Park. 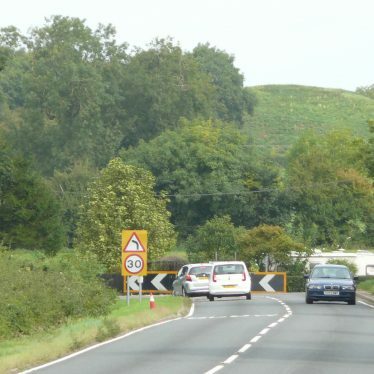 The site of Boteler's Castle, a Medieval motte and bailey castle, which has been partially excavated. The site lies 700m south east of Arrow. 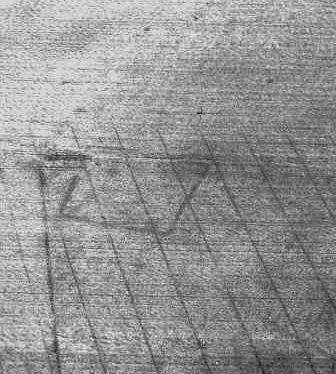 Linear features of unknown date are visible as cropmarks on aerial photographs. They are situated to the west of Coldcomfort Wood, Arrow. The site of a disused canal, a waterway used for transporting goods. 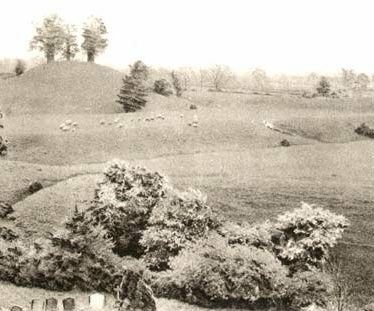 It dated to the Imperial period, was part of the Oxford Canal, and was located 1200m north of Willoughby. 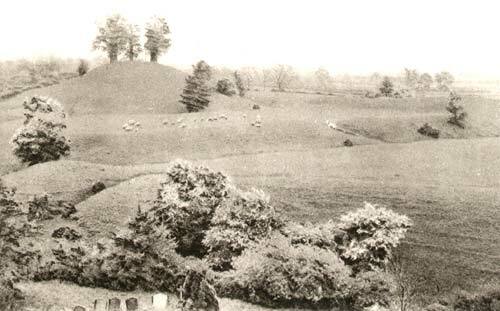 The site of an enclosure of unknown date. It is visible as a cropmark on aerial photographs. The enclosure is situated 300m north east of Stoneleigh. An enclosure is visible as a cropmark on aerial photographs. It is situated 800m south east of Bourton Heath.